After 38 grueling hours in transit, I stood in a stifling hotbox that smelled of musty sweat and stale armpits. With no air-conditioning or even ventilation to speak of, I stood miserably in line at the disaster, death-trap that was Zanzibar customs. My trip was put together rather last minute, and the travel agency who booked everything failed to mention the visa-upon-entry process. Which consisted of looking at a long list of countries taped to a wall, finding your countries relative fee, only to then stand in another line sandwiched between large, sweaty, aggressive tourists, and eventually pay by visa or cash for your entry visa. Once you have your receipt, you wait in another ridiculously slow moving line to drop off your passport, scan your fingertips, and give them your information. After this ENTIRELY exhausting process is complete… you sweat out any and all possible toxins in your body and mindlessly wait in the same sauna-of-a-room for the attendant to eventually yell “United States, Jordyn”. (My whole process was made even more dramatic by the fact that I’d somehow left my only visa credit card at Paul’s bakery back in the airport in Dubai and had no cash, forcing me to haphazardly sneak through customs to get cash from my driver). Needless to say this process was the biggest test for any sane persons patience and built up the perfect amount of angst, stress, and frustration before my journey to the resort. After a 45-minute journey across the island we arrived at Baraza Resort and everything in my body and mind began to melt away. With the chilled lemongrass towel over my face, I took in my first deep breath and allowed myself to willingly forget all that had just transpired. I checked into my two-bedroom villa, drank hibiscus tea, and thought about literally nothing else the rest of the afternoon. The Baraza Resort and Spa is an absolute oasis located along the Bwejuu – Paje beach and is everything you could ever want in an island getaway. It is this bright, sensual blend of French Moroccan decor with fresh tropical accents. Warm smiles of helpful staff welcome any question or need you may conjure up during your stay. This five-star resort also happens to be all-inclusive… where breakfast, lunch, and dinner is as thoughtfully prepared as it is delicious. With beautiful cocktail hours in the evenings, guests can chat and mingle as the live band serenades them under the stars. Each morning at sunrise, I would walk to the beach to take in the ever-changing pastel sky. I would follow it up with a morning run, swim, or kayaking session just off the coast. With help from the concierge, I organized a trip to Stone Town, swam with dolphins in the wild, and visited a local spice farm run entirely by locals who live on the property. I walked down the beach to the sister resort Breezes and signed up to scuba dive for the day. After the reef dive, the instructor offered to take me on his moped to watch a local soccer match then we cruised over to a locals-only beach and drank Kilimanjaro beer as the sun set. Zanzibar is a tropical diamond in the rough. The island is rich in culture… from the music, cuisine, and local lifestyle to the strength and perseverance of a country that has overcome a difficult past. It’s taken me 28 years exactly to get fully into the mindset and state that I am currently in now. A place where I creatively express what’s inside through imagery, writing, style, and conversation. I believe thoroughly in love but more importantly in patience. I do what makes me happy. I live for myself, yet get high off making others feel present and appreciated. I realize not everyone can or will understand me. I fully get that my lifestyle is unusual, hard to grasp, even frustrating to some if not most people. I have built a foundation that involves following my heart and doing what feeds me most spiritually. I have found that consciously replacing doubt, fear, and insecurity with self-love, trust, and positive inertia can change any mindset or dreaded situation. I had to realize people who understand the least typically love to assume, judge, and criticize the most. I have learned that my body is my temple and I can control anything I want within it with mindfulness and awareness. I now know that New York, past relationships, and tough love made me a bit rough around the edges at times. Sensitive people, friends, and situations allowed me the grace to ease up on the reigns and take a deep breath. I feel invigorated, alive, and reborn with each new place I discover on the unfathomably beautiful earth. I fully try to appreciate every person I come into contact with wherther it’s a stranger or close acquaintance. I have been practicing the art of letting things go. Be it the things that hurt me, relationships that don’t serve me, or mishaps or mistakes along the way. Nothing comes before family. They have seen me at my best and worst and love me unconditionally either way, which makes me extremely lucky. Yet I have to remember that it’s my family, and that the interworking relationships within them are mine to develop, expand on, or take space from as needed. I never needed to teach myself to stop and enjoy the moment. That has, for some reason, always been there. When I was a child, I remember thinking “I’m just here, playing in my toy box and thats all that I want to do right now”. I always kissed my parents goodbye before school and meant it when I told them I loved them. I consciously always took a good hard study of each grandparent before leaving their presence. I never knew what a blessing it would be to have such an incredible sibling. She was my first friend and is still my best friend. Sharing love, light, and hard laughter along with pain, heartbreak, and confusion with her is one of my greatest joys in life. I never underestimate her ability to build me up while keeping me grounded. I have learned what it truly means to be a good friend, and to have earned amazing friends in return. Hard work and dedication to my closest friends allowed me the opportunity to be loved, fully understood, and accepted for every single ridiculous part of who I am. I know that friendship is work, and communication is key. Considerate honesty, though uncomfortable at times, saves everything. I always happily remind myself that acquiring things will not make me feel anymore complete nor will comparing myself to others. This is a daily practice, and one that is important for me in order to maintain balance. I have gotten to exactly where I am today because of my strong determined mind, the incredible love and support of those I love staying so closely around me, and because while I never truly forget where I’ve come from… my imagination is wild and my curiosity never ceases to subside. Age is a number more than ever these days, and with each passing year I grow stronger, wiser, and happier. Not because I’m lucky or have it easy, but because those elements are what I actively want and desire in life. So cheers to the people, experiences, and journeys that shape us and make us who we are everyday. And to never peaking. We may be getting older but we just keep getting better. A look of bewilderment crossed the captains face as he stared at me through his thin-rimmed glasses. It was a refreshing change of pace, being called out for something I’ve never done versus something crazy I had. Over a truffle-topped Wagyu steak at the captains dinner, I explained just how tainted I knew I would inevitably become, being that this luxury yacht in the Seychelles was my first real “cruise” experience. Visions of sunburnt tourists chain smoking, day drinking well cocktails, and gambling days away at sea flood my mind when I even hear the term cruise. Scarred by tales of inconvenient preplanned agendas, mindless lackluster buffets, and screaming children… it should come as no surprise why cruising was never high up on my bucketlist. However, a few days into my trip to the Seychelles with fellow travel blogger Kiersten Rich (The Blonde Abroad) she got a call from Crystal Cruises. Kiersten had previously been on a two-week cruise with them over New Years through Brazil, and they informed her that one of their newest yachts would be reaching the Seychelles that coming Saturday. Within the next few hours we were both changing our flights and extending our trip to board the Crystal Espirt yacht leaving out of Mahe Island. From the second I boarded the yacht, it was clear that this experience would be the perfect combination of modern luxury, premium hospitality, and fully curated experiences. Every room was ocean facing and came with your own personal butler. Nathaniel, my all-smiles butler (who was an absolutely dream, I literally locked myself out of my room like three times.. oops) was there to cater to my every need big or small. Everyday we woke in a new destination with plenty to explore. In the mornings we would sip mimosas, catch the rays, and plan out our excursions for the day. Afternoons spent jetskiing, snorkeling, hiking, and biking showed us the many sides to these magical islands that were all planned and done at our own pace. The yacht also has its very own 3-person submarine, allowing you to spy on fish and view the variety of corals and marine life all without even getting wet (so epic). Around sunset we would lift anchor and begin our journey onward to the next beautiful spot. We would watch the coastlines of tiny remote islands and inlets pass as the sun changed the sky just before it disappeared for the night. The food onboard was absolutely unbelievable. Sadly, I’m from New York, with a chef for a father… so it tends to take quite a lot to really impress me. I was completely blown away. A different gourmet menu every night, filled with local dishes, delicacies and the freshest fish caught same day (I mean whats not to love). There is also a gym onboard and daily fitness classes and activities from paddle-boarding pilates to cardio and ab classes, it was honestly the perfect way to make up for all the culinary indulgences explored the night prior. After a short 45 minute flight from Bangkok, I landed in what felt like a Thai version of Disneyland. Exiting the plane at the bite-size airport in Trat, I boarded the cutest little tram-like vehicle and rode in the open air, past fresh hedges cut into the shapes of elephants. The dream. I grabbed my bags and got into a taxi. We drove for about five minutes then joined the queue for the frequent ferry over to Koh Chang. Once on the ferry, I got out van, stretched my legs, and took in the views with a fresh bottle of Chang local beer. We arrived on Koh Chang 20 minutes later and drove up through the mountainous terrain to the tropical oasis of Emerald Cove. This beautiful, 165 room, 4-star resort is airy, elegant and has absolutely everything you need to relax and fade away on a tropical vacation without totally emptying your wallet. After a chilled lemongrass and jasmine towel to the face and a much needed welcome drink, I was fully checked into my ocean-view suite. The staff was extremely helpful with any request I could drum up and had plenty of recommendations for ways to spend the day. The resort is located on Klong Prao Beach, where the tide is rather high (there are certain times of the day where the water comes right up to the wall barrier) but the water is warm and clean. 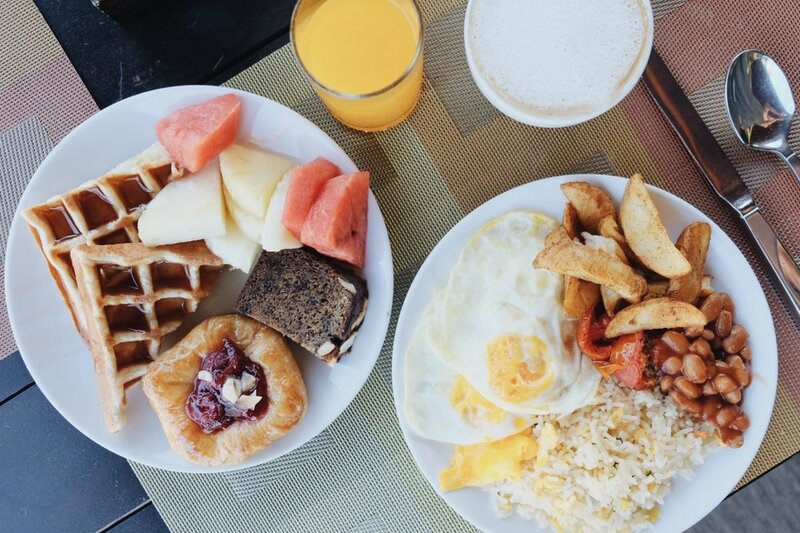 Breakfast is an incredible spread of fresh tropical fruits, pastries, and thai specialities as well as fresh juices and an omelette station. I spent my days basking in the sun, sipping on fruity drinks and taking a dip in their amazing 165-foot infinity pool. Pastel sunsets brought in by live music, happy hour drinks, and beach barbecues made me fully appreciate my annual vacation before the holidays. The spa was well appointed with plenty of staff on hand to offer traditional Thai massages for a mind-blowing bargain, only possible in South East Asia. The front desk also helped me with everything from booking a private day trip on a speedboat to sharing their favorite local dive bar on the island. Emerald Cove has all the modern amenities and comforts of home, in a modern and sophisticated atmosphere, a truly rare find on the remote and casual island of Koh Chang. From the rooms to the food, massages to the daily ringing bell of happy hour… Emerald Cove was everything I needed in a beach resort and more. It’s the perfect place to call home while discovering all that Elephant Island has to offer. Rates start at $120/per night for standard room.